Golden State Woman: $30 for This ??? For one medium, barbecued chicken pizza with cracker-thin crust, barely-there cheese, maybe a dozen tiny kernels of chicken, and a slash of sweet barbecue sauce. 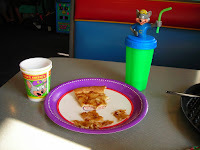 And for one plastic cup topped with a grinning Chuck E. Cheese, plus a handful of tokens for kiddie rides. No drinks. And for 90 uninterrupted minutes watching our 2 1/2 year old granddaughter experience pure joy with an abandonment only felt by young children. Yes, $30 is a ridiculous over-charge for services provided by this popular emporium. And yes, our time shared there with Gabriela was, indeed, priceless beyond words.